Notes: The film was first shown at Canada's Fantasia International Film Festival in 2009, which, strangely, occurred before it was even released in Japan. In what appears to be the near future, a Japanese city is home to teenagers who "tame" shapeshifting creatures of unknown origin. One of these is a small animal named Cenco, whose companion, a sullen boy named Tetsu, hides him by keeping him in the forms of inanimate objects. They live a peaceful, if precarious, existence that is unsettled one day when a girl named Yuki becomes suspicious of Tetsu's "bike". Fairly often, I find an anime series that would have been better had its material been condensed, perhaps into a movie, but discovering a movie that would have been better told as an OAV or TV series is much more rare. 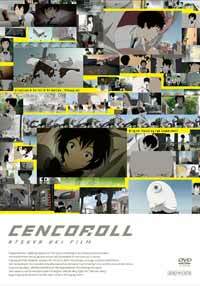 With Cencoroll, a short film released in 2009, I have found an exception. It's both an astounding achievement and a frustrating quandary, for while it gives us a beautiful story and a marvelously thought-out new universe, it lacks the space to give us background and fails to give us quite enough time to enjoy its innovations. Although Cencoroll has some nominal similarities with the Transformers franchise (which end beyond the fact that both Cenco and Optimus Prime can change into cars), I have honestly never seen anything quite like it. The "morphs" (for lack of an official term) are as strange and as varied as the billion-some species of beetle, and each has an unmistakable design. None, however, seem particularly constrained to one form: Cenco himself vaguely resembles a beluga whale, but when trying to shield Yuki and Tetsu he instead begins to look like a caterpillar...though not so much that we start to think of him as one. Each morph has unmistakable features and yet never looks so much like a real animal that it ceases to inspire mystery, and it's quite impressive that the film manages to make them so distinct and so "flexible" at the same time. The wealth of ideas surrounding them is just astounding, too: the concept of these characters being "directed" by hair-like projections on their tamers' heads and the unorthodox transformations (Cenco turns into a stuffed panda at one point, but his eyes and mouth appear on the side of the animal instead of its face) are just two of the innovations that led me to admire the film's braveness. Although the artwork and animation can be an acquired taste, they are as astounding and as unorthodox as the story. The morphs themselves are superbly animated and detailed, and their personalities manifest in the forms of particularly distinctive transformations. In one scene, a morph appears out of thin air behind Yuki, first showing its disembodied, toothy mooth (akin to the Chesire Cat), moving that mouth towards her as if to bite her, and then revealing a set of tentacles that have been wrapped around Yuki the whole time without her realizing it. The humans, who are some of the few anime characters with Asian features, are animated sharply and carefully as well: their spiky but realistic-looking hair blows in the breeze and then shoots out their "antennae" like plant shoots, and their facial features are both appealingly soft but sharp and detailed enough to not be cutesy. The art is rendered in muted pastel colors, and the background paintings, which remind me a bit of Classical Japanese Art and a lot of 20th century Realism, are consistently beautiful. While budget limitations sometimes show (the few visible background characters do not move, for example), the visuals are on the whole so impressive that the little flaws never leave a huge impression. However, Cencoroll is best not watched casually, for it wastes no time and puts importance on almost every frame. Personal experience taught me that watching it in a distracted state is a poor idea, for the plot and dialogue go by at bullet speed and can easily become overwhelming. While this didn't really detract from my enjoyment, I do have to say that the film has almost no breathing room. The pacing, which usually stays at a fast but relatively comfortable rate, becomes noticeably rushed during the climax, and although the ending resolves the plot contained within the film itself, the overall story is left open-ended, leaving the characters in essentially the same place as they were at the start. The movie, although highly entertaining, does leave one wanting more at the end, and although the announcement of a sequel indicates that we may eventually find out more, the current lack of answers is frustrating. What makes Cencoroll even more frustrating is that it fleshes out its characters so well, and as a result it's infuriating when we come to the end of the film and find that we've learned almost nothing about them. Cenco himself is by far the star of the show: though devoid of a voice or any sort of anthropomorphic tendencies, his mannerisms (which are best left unspoiled) make him by far the film's most lovable character. Yuki is also a joy to way, for her sweet, mildly naiive, and inquisitive personality combines well with a complete lack of angst and a surprisingly headstrong approach to turn her into a vibrant heroine. Although she is the film's most "normal" character, she, instead of hiding in cowardice or becoming obliviously gleeful, instantly becomes an important player without hesitating or ever behaving like a damsel-in-distress. And although Tetsu initially comes across as a bit of an expressionless nihilist, his dry and stoic personality contrasts perfectly with Yuki's gregariousness and Cenco's sometimes childish antics. Very, very subtle bits of dialogue tell us that he cares more about Cenco than he will admit, and I believe that his stoic personality is more the result of his lonely, tough, and survivalist life as a "tamer" than of nihilism; the fact that Shu shares some of these traits further hints at this. It's the sort of thing that I would like to know more about, but sadly, we get not a single drop of background on the characters and learn absolutely nothing about the origin of the morphs. While this does keep the plot on track and prevent it from being overwhelmed with flashbacks, it's quite easy to come away feeling tantalized. Remarkably, otherwise unknown director Atsuya Uki made Cencoroll almost entirely on his own, the only outside help being the music and voice acting (with RahXephon's Hiro Shimono voicing Tetsu). It's quite impressive that Uki, with his scant assistance, pulled off such a breathtaking film on his first try, and the relative rarity of anime that truly screams "independent" will make this as much a treat to fans of indie films as it is to anime buffs. All of the elements to make it perfect are there: the universe Uki gives us is astounding, the art and animation are a triumph, the writing and voice acting are understated but heartfelt, and the music, a sparse electronic soundtrack, fits the atmosphere flawlessly. There is a lot to like about Cencoroll; the only problem is that we just don't have enough of Cencoroll. Recommended Audience: Although there is violence, there is no bloodshed. It is, however, worth noting that the morphs endure some slightly disturbing dismemberment in a few scenes.